Gabriela Tudor Foundation and the National Dance Centre in Bucharest present the “E-Motional Festival: moving bodies & cities”, to take place between April 12-14 at the Museum for Contemporary Arts in Bucharest, co-organising partner of the event, as well as at ZonaD – Serial Paradise studio. The festival closes the E-Motional Bodies & Cities, a two-year programme dedicated to mobility and artistic exchanges in the field of contemporary dance, organised between 2011-2013. The festival will include video-installation vernisage, public events and process sharings dedicated to the E-Motional artistic research, performances from Romania, Latvia, Cyprus and Turkey, among which the premiere of two international co-productions. The event also hosts two roundatbles, one dedicated toCreative Europe, the upcoming EU funding programme for cultural projects, presented in partnership with the Cultural Contact Point of Romania, the second one dedicated to artistic collaboration at international level. The festival will gather over 30 artists participating to the programme, among whom one can count from Romania- Mircea Ghinea, Mădălina Dan, Mihaela Dancs, Vlaicu Golcea, Farid Fairuz, Bogdana Pascal, from Ireland – Laura Murphy, Fearghus Ó Conchúir, Mary Wycherley, from Latvia – Kaspars Lielgalvis, Olga Zitluhina, Sintija Silina, Katrina Albuze, Kristine Vismane, Roberts Muciņš, Inta Balode, from UK – Gemma Riggs, Luke Pell, din Cipru – Alexis Vassiliou, Arianna Marcoulides, Souzana Fialas & Nicholas Shantos, from Turkey – Özlem Alkış. Festival guests also include artists and programmers from the project countries, as well as from Portugal, USA and Japan. Gabriela Tudor Foundation will officially launch the festival with the opening of the installation that documents the artistic process in the frame of the E-Motional Bodies & Cities project, gathering photo/audio/video materials produced in Romania, Ireland, Latvia, Cyprus and United Kingdom. The opening cocktail is offered by the Embassy of Ireland in Romania in the presence of H.E. Mr. Ambassador Oliver Grogan. In the past few years, whenever I go somewhere abroad, I cannot help getting out of a certain practice: to analyse to what extent that place could adopt me, how fast would it become familiar, what could it offer, what should I give in return? It is pretty clear for me that I am not behaving any more like a tourist, but as a careful researcher, a simply thrilled and subjective observer of the new life around him, empathizing with it. And as many of these thoughts would not concern me if I weren’t a mom, this analogy of the integration in the life of a city with the one of a child that tries to find his place in a family seems to me almost necessary. We often hear this say “adoption country”. In a metaphorical way, to adopt means to hold. I’ve been trying to understand how sincerely could a city hold a stranger, even on a temporary basis, how adequately could it approach him, so that it meets his expectations and it secures that continuum needed for him to feel as a part of the whole. The interdisciplinary artistic research has been central to the E-Motional Bodies & Cities project. Two different artistic teams have embarked together in a collaborative process to explore the relation between the human body, the urban and geo-political context and new technologies. Each team is composed of five artists (from contemporary dance, visual arts and new media), one from each project country, that have gathered for three working residencies, in three different countries – Ireland and Cyprus, for one group, Latvia and UK, for the second one, and Romania for both of them. The two groups have reunited in Bucharest for a final working session focusing on the politics of the body. Between April 4-11, the artists are working at ZonaD studio and at the Museum of Contemporary Art, having the opportunity to discover Bucharest from different perspectives. The residency will conclude with informal presentations open to the audience, the format of process sharing allowing an access to very different collaborative and performative practices developed by the two teams. * Event opened only to festival guests due to space limitations. In Realia (Bucharest/Beirut) Farid Fairuz questions the frail limit between the real and the fictional, thus emphasizing a discourse based on the construction of multiple identities. His approach underlines the ability of today’s culture to impose the unreal and the fictional as realities, as components of a realm in which the line between the possible, the virtual and the real no longer function as they once did. Realia (Bucharest/Beirut) is a performance that combines temporal layers, real and fictional events from the life of a character that simultaneously has two identities: Mihai Mihalcea, born in Bucharest and Farid Fairuz born in Beirut. The dramaturgy is build upon the tension created through a construct that mixes very personal and powerful memories from Bucharest and fictional elements from Beirut and the other way around. The performance explores the need and desire for an ideal partner and an ideal relationship and the fear of being alone. At the same time it questions the limit between performer and audience, while challenging the performance structure to be flexible to be modified through the audience response. Five choreographers (and not all very young and not all women) and one dance critic (and not one of those who love ballet over everything) – all of them together within 60 LIVE minutes with an ambition to share LIVE what the Latvian dance looks like, feels like, doubts about and is about. To achieve that they will offer excerpts from 3 different works plus some extras and all of that wrapped, framed and intruded by those from the team who didn’t have work to show. Come and meet LIVE Latvian dance artists and ask for the truth! Internal Façade frames the performers’ movements by layering live performance and moving image, pace and duration. The work grows out of research conducted by the three artists in Riga in September 2012 as part of the E-Motional Bodies and Cities artistic research strand. (anti) aging was created with the intention to be remade after 30 years, in 2041. Mădălina Dan and Mihaela Dancs propose the creative sanatorium format, aiming for delight, relaxation and psychic comfort, enjoyment of pleasure, vitality and voluptuousness, serene acceptance of the present and preservation for the future. The presentation will address the main changes in the future funding scheme for European cultural projects through “Creative Europe” Programme (new opportunities, new priorities), while offering at the same time a general perspective on the participation of Romanian cultural operators to the Culture Programme (2007-2013). Participants: Cosmin Manolescu (executive director, Gabriela Tudor Foundation, Bucharest), Ghislaine Boddington (creative director, body>data>space, London), Elisabetta Bisaro (program manager, Dance Ireland, Dublin), Natasa Georgiou (director, Dance House Lemesos, Limassol), Carla Peterson (artistic director, New York Live Arts), Atsuko Hisano (program director, Saison Foundation, Tokyo), Alberto Magno Santos (director, Fabrica de Movimentos, Porto), Inta Balode (dance writer, Riga). The roundtable will bring into discussion various visions, approaches and challenges in regards to artistic collaboration and the implantation of international projects. The event is open to artists, managers and to all interested in international cultural cooperation. Entrance to festival events and performance is made based on a suggested donation of 10 lei/ event. A festival pass is also available based on a donation of 80 lei, securing access to all events, including the opening cocktail. The number of passes is limited. The funds raised through donations are exclusively directed to covering the cost of the ZonaD studio administered by Gabriela Tudor Foundation. Details at [email protected], www.e-motional.eu and zonadstudio.wordpress.com. 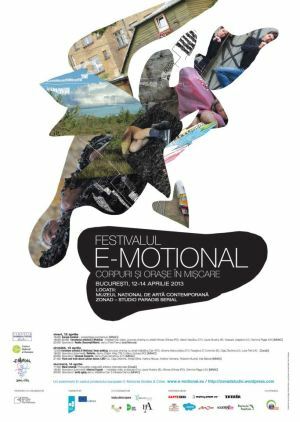 "E-Motional" Festival in Bucharest. You can get here description, reviews, address, time and details of "E-Motional" Festival in Bucharest. Visit Bucharest Tips for more Festival events in Bucharest!